From Wish Factory. Kawaii, a term that denotes cuteness within the context of Japanese culture, is now a prominent feature of Japanese popular culture. Kawaii Cubes are a completely different - and completely adorable - twist on favorite licensed characters. Taking a basic geometric shape, the cube, as its form, the Kawaii Cubes inspire creativity and play, plus their shape makes storing them convenient through stacking. Offered in a variety of styles, Kawaii Cubes will be released in limited quantities, making them collectible and sought-after. 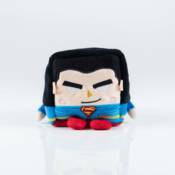 Utilizing the familiar characters from Warner Brothers and DC Comics, the Kawaii Cubes' cute style will introduce these characters to the next generation while also becoming a unique collectible that long-time fans will seek out and cherish. Measuring 4' x 4', these DC Comics Kawaii Cubes include Superman, Batman, Wonder Woman, The Flash, The Joker, and Harley Quinn.